Personalized news app Zite has just made its way to the iPhone -- the same week competitor Flipboard launched for iPhone. Zite, powered by personalization technology, makes it easy for users to find interesting topics and stories to read based on their taste. Zite learns from both explicit -- thumbs-up and thumbs-down -- and implicit -- what stories you click on -- feedback to deliver more relevant news to you. Current Zite for iPad users will be able to use their same profile on the iPhone thanks to Sybil, which allows multiple profiles. While Flipboard's iPhone app came with a new feature, Cover Stories, and changed the scrolling to vertical rather than horizontal, Zite is essentially the same on the iPhone but simply optimized for a smaller screen. LAUNCH will be in contact with Mark today and will update this story after we speak with him. Just yesterday, Google launched a Flipboard-like app called Currents for both iOS and Android. The app delivers magazine-like editions for offline reading. While Zite currently only has one partner, lululemon, Google has already partnered with 150 publishers including Forbes, Al Jazeera, PC World and Zagat. Earlier this month, Zite launched its first branded section for Lululemon but still refrained from placing ads in the app. CNN acquired San Francisco-based Zite for $20 to $25M in August but is allowing it to function as a stand-alone business. Founded in 2005 as a part-time research project by students at the University of British Columbia, the students started the current project in 2010 and launched Zite in March. Entrepreneurship category on Zite for iPhone. 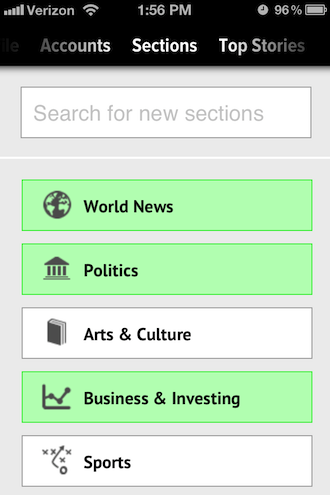 From the Sections tab you can search for and add new sections to your Zite for iPhone app.